Hypnosis is so powerful that it can transform a dysfunctional day into a completely remarkable day. When you begin your journey using hypnosis you might be full of fear and worry. But upon completion, you will have experienced a shift. In a very miraculous way, you will have let go of any fears and worries. Hypnotherapy has become the most helpful and significant practice in many people’s life. Whether it’s to reduce stress, feel physically and mentally stronger, be healthier, peaceful, creative and happy. A study on hypnotherapy, showed that one 20-minute self-hypnosis session can lower your cortisol levels by 30 percent. This is pretty impressive because an 8 hour deep sleep will only lower your cortisol levels by 10 percent. And cortisol is the stress hormone causing people to be sick and sad. Perhaps you feel stressed during the day and can’t concentrate on simple tasks. Maybe you are completely exhausted by 5pm. Or, you just can’t sleep at night. These are all warning signs that you are not aligned with your higher self. Your vibrational energy is not in balance with your natural state. Your energy has immense power over your life. Which is why it’s important to become more balanced. Did you know that energy is formed through written and spoken words. As John 1:1 states “In the beginning was the Word, and the Word was with God, and the Word was God.” Replace God with super-conscious and you may understand me better. “In the beginning was the Word, and the Word was with super-conscious, and the Word was super-conscious.” Or “In the beginning was the Word, and the Word was with higher-self, and the Word was higher-self.” I teach my students to understand that God is part of the super-conscious mind or higher-self. When you act from a fearful, low-frequency vibrational state of energy, your thoughts poison your life, your mind, your body. Nevertheless, when you come from a place of encouragement, positivity, enthusiasm and joy, your life becomes heaven on earth. With hypnotherapy you can take responsibility for your own thoughts, words, perceptions and energy. With the tools I teach at UAE Hypnosis, you can transform your life, and it’s easier that you may think. I teach all my students and clients through workshops and personal sessions about perception. It’s your perceptions and stories you tell about yourself, to yourself and to others that is creating your reality. When you learn to shift your perceptions, and tell a new story, your life will change – I promise! So how can you turn your life around with hypnotherapy? First and foremost, it’s important to forgive the past. You must take the negatives and turn them into a learning lesson. After all, that is why we are all here, to learn lessons. With hypnotherapy you can understand your past, gain clarity and easily let go of the weight holding you down. With hypnotherapy you can evolve, grow and make a new action plan for a better life. Your excitement and enthusiasm for a bigger, better life will open new doors, create new paths, and bring to you heightened energy to drive you towards success. It’s true that what the mind believes the body achieves. What you focus on will come to form. Today I’m sharing a free 20 minute self-hypnosis video for you to listen to. It’s there to help you achieve any goal. It will relax your mind and body and guide you through mental imagery towards success. It’s a good introduction to hypnosis and will allow you to get the “feel” for it. Self-hypnosis is a way many of my clients began their hypnotherapy journey. Once they experienced results from a simple recording they decided to make even greater change with personalized live hypnotherapy sessions. For them, that’s when the big results happen. With live one-on-one personalized sessions clients are able to achieve their prime goals and overcome their greatest obstacles. Enjoy your journey to self-discovery and self-improvement. 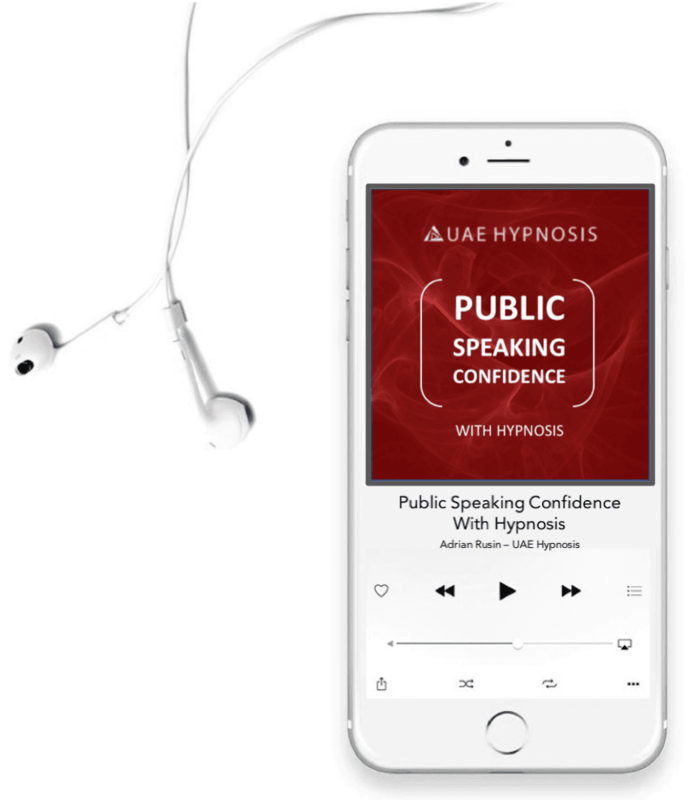 Self-hypnosis to make public speaking easy and enjoyable. Written and recorded by Adrian Rusin CMS-CHT. Private hypnotherapy sessions in Dubai, Abu Dhabi and Globally Online. Customized Self-Hypnosis Audio’s Created and Recorded Just for you.